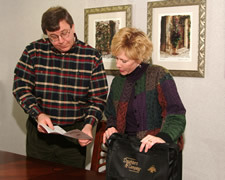 We serve the older adult in any setting: Home, retirement community, assisted living or nursing home. We provide direct, non-medical services to the enrolled client, through a Staff Daughter. We follow standards of practice designed for professional geriatric care managers. We neither accept payment nor offer compensation for referrals. Our Staff Daughters do not accept gifts of value from their clients. We have no minimum time commitment in our contracts. Autos used for client transportation are furnished only by company contract. They are not owned by the Staff Daughters. Services provided by the same Staff Daughter, with secondary backup, to provide continuity and bonding with client. Freedom to express feelings to a friend who will keep the information confidential.